I purchased the Saleae Logic16 a few months back to “sniff” a SPI bus and since then I keep on using it as my default Logic Analyzer — that’s when you know it’s money well spent. Saleae offers two models — a 8 channel ($149) and a 16 channel ($299). I went for the 16 channel version because it offers a bit more bandwidth (sample 2 channels at 100MHz, 4 channels at 50MHz, 8 channels at 25MHz, or all 16 channels). 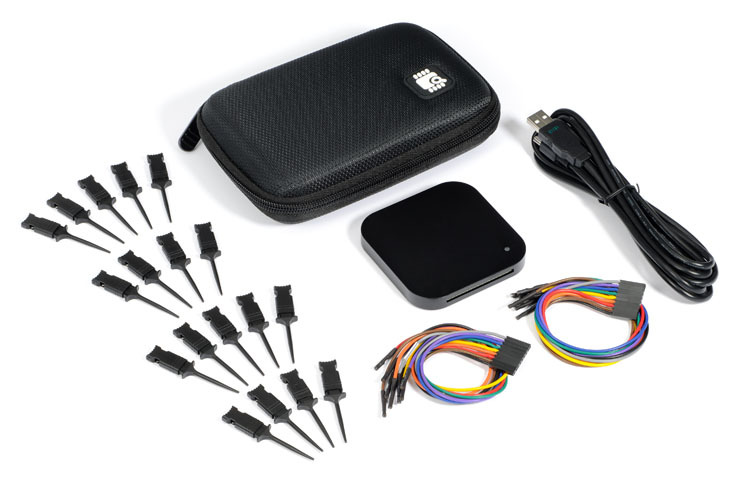 The hardware is solid and well made and ships with everything you need — a nice hard case, USB cable and color coded wiring harness with micro-hook probes. The best part, however, is the software — I use a MacBook Pro (also running WindowsXP via VMWare) with 16gb ram and it’s always better to run native apps as much as possible but most companies don’t provide native apps for OSX, hence VMWare. Saleae actually offers ports of their software that runs on all major platforms (Windows, OSX, Linux). The software offers almost endless sample captures but the most useful feature is the protocol analyzer. It currently supports I2C, Async Serial, SPI, 1-Wire, CAN, I2S, PCM, UNI/O, Manchester, and MP Mode — making it easier to see the decoded results along with the waveform So far I have used I2C, SPI, I2S/PCM and Async Serial with it working flawlessly.